The other day the wife “dragged” me into a small mono cafe which is located 20 meters from the Great Intercession (Bolshaya Pokrovskaya street), that in the center of Nizhny Novgorod. I remember, earlier the cafe “Fly” was located here, we were visiting it when were students. As my wife says now it is a fashion trend, Cafe “Freakadely” specializing in meatballs. I remember ever since, that there is very little room and sometimes we sat on the fence next, but yielded to persuasion and we “only looked”. In the end, not at all disappointed, mostly because here there are cider “St Anton”, for some time now I have great respect for it. 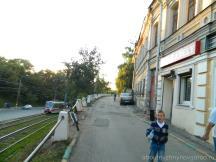 By the end of the walk through the historic center of Nizhny baby was very hungry, so we decided to feed him. As I understand that these places are exactly for a quick bite. It are “mono” because specialize in any particular dish. In this case, we tasted the basic proposal “meatballs”. 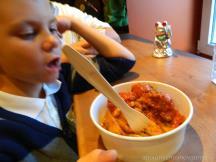 Son ate most feck of dish, but we tested too. I am not a professional in this matter, but three balls were really from meat, and not from bread with a little bit meat. I have not had time to photograph a full portion :) For 150 rubles it’s gangbusters. While approaching the cafe, I was preparing myself to what will “choke” beer from Lyskovo but was surprised from “yuzberg” and was happy from cider… Especially it was St Anton, in addition draught. Hundred rubles for 0.3 is not cheap, but in the bottle it cost 60. About the price, lunch with soup is 200 rubles, as a normal business lunch. The decor here is as in Sparta (ascetic). High wood (not soft) chairs, not wide bar along the walls and a round table in the center. To jump, grab mono dish :) and to gallop forward or leave as we once did, on the street and sit on the fence (so did the company, who came in after us). Especially because tableware are eco-disposable and made ​​of paper. When compared to cafe “fly”, now the space is used more efficiently, but the inconvenience of going to the toilet for tall men left :). I wonder who has left figure a cat waving hand and for whom!? Baby long hovered over him, trying to understand, why the beast is waving not stop. If this idea of the cafe, it is necessary to continue the theme by something similar. Address: Oktyabrska street, 6. Fone: +7915 949-07-13 Web: freakadely.ru, there are many, many images. Work: Tue-Sun: 12:00 – 22:00 it seems they do NOT work in Monday. 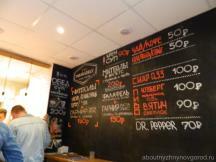 The cafe is located just next to our street-attraction Pokrovka. If you go from the Gorky Square, then reaching the tram tracks to the left to see leaving up street (street Lykov Dam). Here is “FREAKADELY”. Well, from the square of Minin turn right to rails. This entry was posted in Cafe and tagged in the center. Restaurant White wolf – good luck!